A thread for the graduates of the last and final year of the S65 E92 M3? Post your pics +/- about how much you love your M3! I know several of you from 'group therapy' while we were / are waiting patiently for our 2013's .... I hope you will add your pics when you get yours! I'll kick off the thread. Unfortunately, not many pictures yet as I didn't have time to drive nor take enough pictures of her today. p.s. I will add more pictures of the Azurite when I get a chance to photograph her in the sun, and under different lighting conditions. 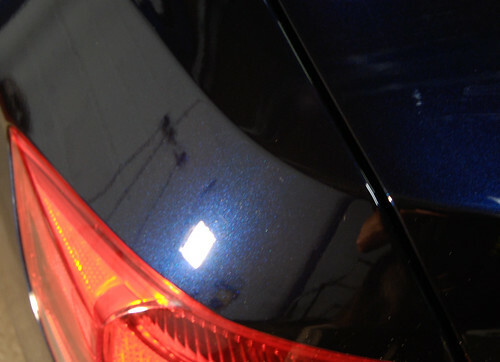 In short, it is very similar to Carbon Black, except the blue pigments are more sparkly. And the color can change from dark blue to black to dark blue again, even under the sunlight. OMG, I am in LOVE!!! She is PERFECT!!! I am loving your garage!! Enjoy the car and being back to two cars in the household!!! LOL, I am guessing the top two pics are not her garage, but the 4th and 5th pics are. i get that every time I drive my car. Wow, you get to buy it - but without getting the car right away. I know I'm supposed to say happy thoughts, but I can't! It will be torture for you! But one thing for sure. You cannot ever replicate the experience of driving your M3 on the autobahn and the Alps. If I had been able to do it, I think I would have fainted from happiness. They're just something about the M... I don't know if I can sleep tonight. I feel like going to the garage, and giving her a hug and kiss goodnight. Congratulations Julie! You can actually see a bit of the blue in the 3rd picture. Yes please take some more when you capture it in sunlight. I feel like going to the garage, and giving her a hug and kiss goodnight. Awesome pictures Julie! I am so jealous...my boat docks in Oxnard tonight. I can't wait to see it for the first time. Pictures to come soon! By the way, I can't wait for you guys to join the Class of 2013!! Congrats! The color looks fantastic! Any mods on the horizon? Ugh the wait is killing me, mines on the boat right now and the earliest available PCD date was oct11th cant wait to see that contrast stitching! Thanks tlp! Yes, it took 10 months from (first) order to delivery. Long story. And I am exhausted, lol. Another classmate! In a way, we - as well as all the other E9X owners - are really lucky. I turned off my sound system (I never do that), and slowed down and sped up over and over again - just to be able to listen to the engine over and over again. She's so responsive, she sounds so perfect. Unfortunately, she is also the end - and the epitome - of a quarter century of naturally-aspirated M3's. I'm actually all for turbo's. But I am sad this is the end. Hey M3 Esq - I meant to reply to your other post! Possibly the M Performance Exhaust.... and white angel eyes. I'm really looking forward to seeing yours! I remember when I first starting lurking here on m3post, and you were getting your first M! Yes, the wait is BAAAAAAAD.......... I won't lie. It won't get any better! And man, I want to see that contrast stitching too!! You'd better post pics! If you will be purchasing ANY AT&T services online or in store could you mention that you were referred by me? My Employee Referral ID is eo4489. This would be a great help and it costs you nothing, thank you!